Fresh from their 2017 PBS TV Special Celtic Journeys: Songs & Soundtracks, "World's Most Recorded Piper" Eric Rigler (soloist on Braveheart, Titanic, The Simpsons, etc.) and multi-talented guitarist Dirk Freymuth create a musical panorama of Celtic spirit and energy. Drawing from haunting Irish melodies, blazing jigs & reels, and themes from Eric’s film & television work, the two produce a sublime sonic experience. 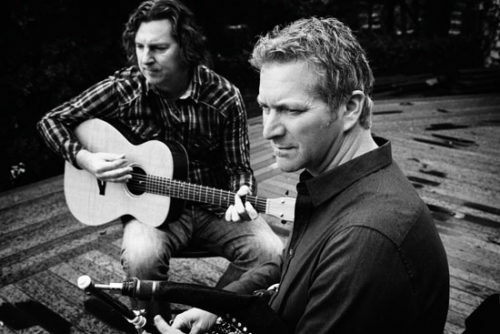 Featuring Eric on Irish uilleann pipes, Scottish small-pipes & whistles, and Dirk on acoustic guitars, the two embarked on their duo project in 2014 with the goal of performing soundtrack music, traditional Celtic & World music, and original compositions using looping pedals, effects processors, and other music technology. Together they create everything from lush cinematic soundscapes to driving melodic grooves. Eric Rigler's legendary 45-year career on the bagpipes is world-famous. From performing "Amazing Grace" at PRESIDENT REAGAN'S funeral to hundreds of appearances, films and recordings such as BRAVEHEART, TITANIC, MEN IN BLACK 3, CINDERELLA MAN, AUSTIN POWERS to CD's for PHIL COLLINS, JOSH GROBAN, FAITH HILL, KEITH URBAN, ROD STEWART to TV's OUTLANDER, BLACK SAILS, THE TONIGHT SHOW with JAY LENO, JIMMY KIMMEL LIVE, BATTLESTAR GALACTICA, CROSSING JORDAN, THE SIMPSONS, and SOUTH PARK, Eric has been called "the most recorded piper in history". Dirk Freymuth’s gifted and diverse artistry on the guitar, lute, Baroque mandolin and viola da gamba spans musical genres from being a member of the Minneapolis power-pop trio, HINDU RODEO, to Dublin’s BAROQUE ORCHESTRA OF IRELAND. As a studio player he has recorded for dozens of artists such as KOTTONMOUTH KINGS, THE PROCLAIMERS, JOHN GORKA and has produced more than fifty albums in a wide variety of styles.